THE TÁNASITE AND Foreign Affairs Minister has said “there’s a lot of pushing and shoving going on right now” in relation to Brexit but that Ireland has the European Union’s full support. Simon Coveney also defended the inclusion of a backstop in the Draft Withdrawal Agreement. Today he brought a memo to Cabinet on the contingency planning put in place in the scenario of a no-deal Brexit. It outlined that all government departments are to be prepared for “all eventualities” in the case of an “orderly” or “disorderly” Brexit. Legal advice from British Attorney General Geoffrey Cox, which was published after MPs found the government in contempt of parliament, warns that the terms of the backstop could trap the UK in “protracted and repeated rounds of negotiations” in the years ahead, the Guardian reports. 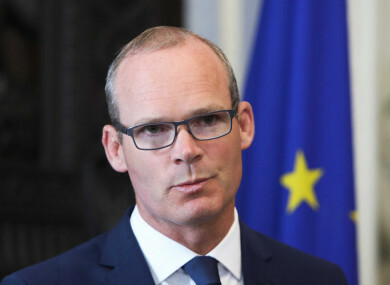 “No one’s looking to trap anybody anywhere,” Coveney said, adding that the draft agreement is the result of both sides working together for over 18 months. He said the backstop is necessary as a last resort and “doesn’t threaten the UK’s economic or political integrity”. The backstop aims to avoid a hard border between the Republic and Northern Ireland and could see the North stay aligned to some EU rules. British Prime Minister Theresa May is set to meet Taoiseach Leo Varadkar in Dublin tomorrow. The two leaders will meet at Government Buildings tomorrow evening in advance of the European Council meeting in Brussels on Thursday and Friday.Yesterday May confirmed she was postponing today’s crucial House of Commons vote on the draft Withdrawal Agreement so she can go back to Brussels and ask for certain changes to be made. Varadkar and Donald Tusk, President of the European Council, have both said the deal struck between the European Union and Britain cannot be renegotiated. May today told Sky News: “There is no deal available that doesn’t have a backstop within it”, but said she wants assurances from the EU that, if it is used, it will be only be a temporary measure. Many politicians have raised concerns about the backstop – including MPs in May’s own Conservative Party, as well as members of Arlene Foster’s Democratic Unionist Party, which is propping up May’s minority government. The DUP believes the backstop threatens the United Kingdom and could lead to a trade border in the Irish Sea. There have been calls for no-confidence motions in both the British government and May to be put forward, as well as calls for May to resign – from outside and inside her own party. Email “Coveney says there's 'a lot of pushing and shoving' going on in relation to Brexit, but the EU has Ireland's back ”. Feedback on “Coveney says there's 'a lot of pushing and shoving' going on in relation to Brexit, but the EU has Ireland's back ”.